The most polarizing player available for the 2014 NFL Draft is Johnny Manziel. Football fans everywhere are bombarded with speculation on his NFL career along with every single thing he does off the field. It’s 24×7 Manziel TV. Most people either think he’s a boom or bust player. I’m glad I’m not paid to make this decision because I believe it could go either way. Manziel is a unique player. He is the type of player that brings excitement to the game by scrambling around and extending plays beyond what the defense can normally defend. If a defensive back has to defend more than 4 or 5 seconds, they normally lose their position on a receiver and that’s where Manziel makes his plays. Manziel also has a good sense for avoiding the rush and escaping to the outside where he makes his living. But does his game translate to the NFL? How many 5-11 QB’s make it in the NFL? Sure, Drew Brees and Russell Wilson have done it, but they are more of the exception than the norm. Manziel makes his living running around and making plays, but the NFL is more than that. At times, you have to drop back and make plays from the pocket. The jury is still out on whether or not he can do that. I’ve heard comparisons to Fran Tarkenton and Doug Flutie, which are fair comparisons. Flutie was an exciting player, but he had to go to Canada to start his career and he struggled to keep a starting job in the NFL due to his size. Tarkenton is a Hall of Famer, but he played in the 60’s and 70’s when players were not as big and fast as today’s NFL players. Manziel made a lot of his plays in college because he was faster and quicker than the competition. When he gets to the NFL, most defenses are loaded with players that may be just as fast or as quick as Manziel. Manziel had an extremely productive career at Texas A&M, but they didn’t exactly win any championships with him at the helm. 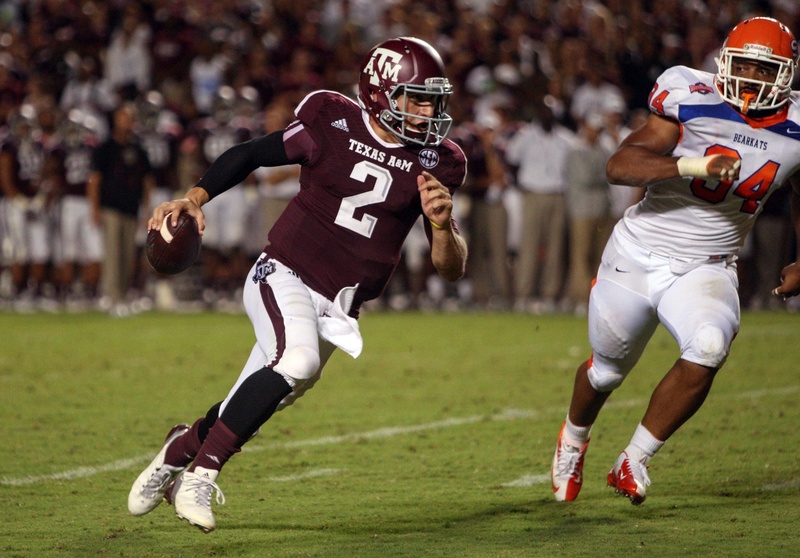 In Manziel’s freshman season, they went 11-2 and played in the Cotton Bowl. Last year they were 9-4 and played in the Chick-fil-A bowl. For all the attention he receives, his teams never played for an SEC or national title. His teams were good, but not great. I have heard that NFL scouts are scared to death trying to defend him. I’m not the most brilliant football tactician, but I believe it wouldn’t be that hard to contain him. I would start off by making sure my pass rush stayed wide, eliminating his ability to scramble to the left or right. Then, I would make sure my defensive tackles got some inside push and got their hands up and make him throw over them. Manziel gets antsy when he is forced to stay in the pocket. He doesn’t have the height to see over big defensive linemen, so he looks to get outside the pocket where he can create chaos. The last part of the puzzle would be to go after the football if he breaks from containment. Mainsail tends to wave the ball around rather than tuck into this body. I would have my pass rushers going for the strip. I would also make sure my defensive backs were ready to pick off the ball because Manziel tends to hang the ball up when he is in trouble. I believe this defensive scheme would force him into making more mistakes than plays. If you can minimize the lucky plays, I believe he could be forced to press and turn the ball over. If I were an NFL GM, I would be worried about the off the field exploits. The stories of partying have died down, but will they ever completely go away? Up to this point, Manziel has hidden behind the excuse of being a 20 year-old college student and has refused to accept responsibility for his actions. Sure, he hasn’t done anything extreme, but I would be concerned about giving him a dump truck full of money. His own dad told ESPN Magazine that he was afraid that Johnny would implode and when he did, it could be ugly. I’m just not sure I could risk my job by picking him in the first round and trusting that the character issues were a thing of the past. If it were my decision to make, I would have to let someone else take a chance on him. I understand all of the reasons for drafting him, but I believe the negatives outweigh the positives and I’m not completely sold that his game will translate to the next level. This entry was posted on May 5, 2014 by draftmaniacs in Draft profiles and tagged 2014 NFL draft, Johnny Football, Johnny Manziel, NFL, NFL Draft.